How To Install Backtrack 5 On Virtual Machine ? 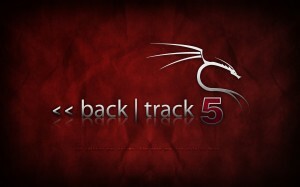 Home » BACKTRACK » VIRTUAL MACHINE » How To Install Backtrack 5 On Virtual Machine ? If you want to experience and experiment with backtrack 5 hacking tools such as kismet, metasploit etc. Then today i am going to show you how you can install and run Backtrack 5 Operating System inside a virtual machine(VirtualBox). It works on all computers running any operating system such as Windows Xp, Windows 7, Or Mac Os X. So lets get stared installing backtrack 5 on your operating system. 1. First you will need Virtual Machine to run Backtrack 5 which you can Download From VirtualBox Website. After downloading VirtualBox Install the program. Installing VirtualBox is really simple like any other program you install on your computer. 2. Then you will need Backtrack 5 .iso file which you can download from Here with below configuration. You can download it directly or via torrent thats your choice. 1. Open VirtualBox and Click on New. Then a popup box will appear in that write Name as backtrack, Type as Linux and Version as Ubuntu as shown in below picture and click on Next. 2. Next allocate memory to your virtual machine. I usually allocate half the ram i have which is 2GB of 4GB as shown below and click Next. 3. Then choose second option Create Virtual Hard Drive Now from three options and then click on Next. 4. 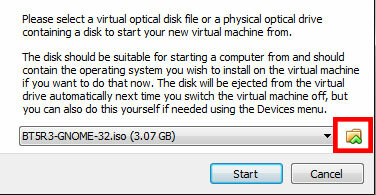 Then Choose VDI(Virtual Disk Image) From all the options and click Next. 6. Then leave name as it is and allocate the size to arround 15-20GB and click Create. 7. Now you will have your virtual machine on left. To start it double click the virtual machine. As you running it for the first time you need to configure it. 8. Navigate to the Backtrack 5 .iso file we downloaded by clicking on button i highlighted in red in below image and select it and click on start. 9. After clicking on start click Enter and leave the setting as it is and press Enter again. 10. Now it will ask for command so type startx and press Enter and it will load user interface of backtrack. 11. Click on Install Backtrack icon from desktop and it will open installation window. Now leave language to English and click on Forward. It will now ask for location, Enter your location and press Forward. 12. On Step 3,4,5,6 you don't need to do anything just click on Forward and on step 7 Click on Install. It will take couple of minutes and you will have backtrack 5 install on your computer. 13. Now will need to enter username and password to enter backtrack, the default username for backtrack is root and password is toor. You can use passswd command to change your password. 14. Done you now have Backtrack 5 running on your virtual machine. If got problem installing backtrack 5 on your virtual machine or got struck on any of the steps, or liked our tutorial then leave a comment below i will be glad to help you out. You have finished reading How To Install Backtrack 5 On Virtual Machine ? and many articles about Tech Gallery in our blog this, please read it. and url link of this article is https://littlebitjohnny.blogspot.com/2013/01/how-to-install-backtrack-5-on-virtual.html Hopefully discussion articles on provide more knowledge about the world of new tech gadgets. Related : How To Install Backtrack 5 On Virtual Machine ?